Last week, Australia said goodbye to one of its theatrical matriarchs. Betty Burstall, the enigmatic founder of Melbourne’s La Mama Experimental Theatre Club, died peacefully aged 87. Her legacy includes the theatre she founded in the 1970s and the countless playwrights, actors, directors and other creatives she nurtured over her long career. The inspiration behind La Mama came from the time Burstall spent in New York in the 1960s. There she encountered a thriving experimental theatre scene in which writers and performers created dynamic works that commented on social issues as well as offering contemporary views on the human condition. She also came across an eclectic theatre, La Mama (which is still in operation). Upon her return to Australian Burstall saw this contemporary, experimental approach lacking in our theatre world, and set about sparking the debate. David Williamson, speaking to Ross Kavanagh on Radio National earlier in the week, paid tribute to Burstall. 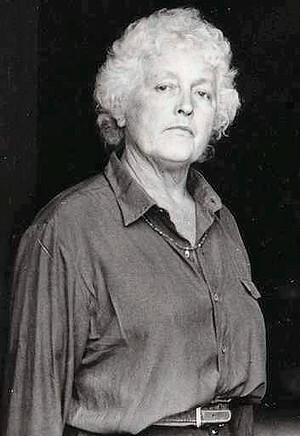 Williamson praised her contribution to the Australian theatre scene, while Kavanagh called her ‘the godmother… of Australian theatre’. Describing Burstall as ‘a remarkable woman’, Williamson reminisced on the pivotal role she played in advancing his career. ‘I owe my whole career to Betty’, he concluded, speaking of Burstall’s positive response to several one-act-plays he sent her. His story is just one of many who were encouraged and assisted by Burstall and her La Mama Theatre. Burstall, it seems, was a passionate individual who devoted her life to the arts. Her portrait by Arthur Boyd captures this passionate intensity. Depicting Burstall deep in thought, her large eyes and flushed cheeks, Boyd emphasises her emotional engagement. Such a depiction seems appropriate, given that theatrical productions aim to engage the emotions of audiences. While Burstall’s larger-than-life personality will be sorely missed, the La Mama theatre lives on. Artistic Director Liz Jones and her team have assembled a rich 2013 series of performances. A special gathering to honour Burstall is currently being planned. Check out the La Mama website for more information. Have just heard of Betty’s passing and are finding it hard to believe. What a wonderful person she was… and I have many fond memories of her, especially regarding my work which she championed in several occasions when reactions to my plays wasn’t that positive. I loved her (one of many) and my time at La Mama was all the more nourishing because of her. I grew up 7 houses down from Betty & there was never a day she didn’t jump on her pushbike & ride to LA Mamma Theatre to practice what she loved…. In some of her spare time taught me some acting skills at my home & was always very encouraging…. Betty was definitely one in a million. This entry was posted in Art, Arts, Theatre and tagged melbourne, playwright, theatre. Bookmark the permalink.